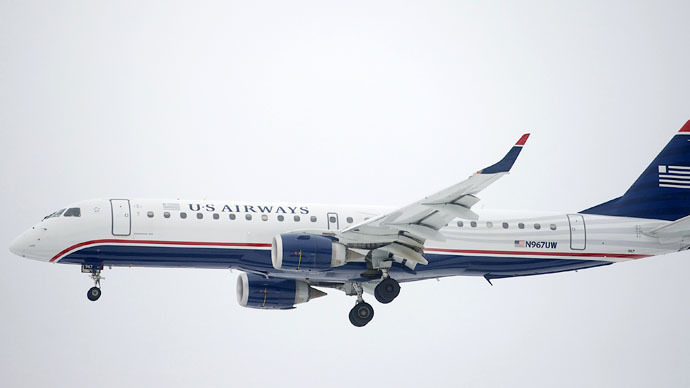 An unexpected malfunction prompted the pilot of a US Airways flight with 56 people onboard to make an emergency landing in Houston late Monday. The pilot was preparing to land the jet at George Bush Intercontinental Airport in Houston, Texas, at around 11 pm local time late Monday, but was caught off guard when the plane’s nose gear failed to deploy. "They did a couple turns around the airport airspace, talked to the FAA tower, tried to get visual confirmation that the nose gear was in fact inoperable," David Hebert, a spokesperson for the Texas airport, told local network KHOU. "Unfortunately it wasn't working properly." Boulton, the passenger, described the landing as “smooth.” Only one of the 52 passengers and four crewmembers aboard the Embraer 190 had to be hospitalized after the incident, the airline acknowledged, but that person’s injuries were said not to be serious. “The passengers exited the aircraft on the tarmac via aircraft slides,” Victoria Lupica, a spokeswoman for American Airlines, explained to WTVR-News, a CBS affiliate. American Airlines, which merged with US Airways, released a statement early Tuesday. “American's primary concern at this time is for our passengers and crew. We are in contact with the authorities and cooperating with response effort,” the company said. According to WTVR, the Federal Aviation Administration is among the agencies that will investigate the incident.